Birds sometimes do amazing things. A fairly predictable thing with raptors in general is that they will keep as much distance as possible from you. Unless, of course, they are habituated. It’s not that they can’t take care of themselves, because they can do some serious damage on humans if they wanted to. I believe it because they take the defense/attack route only when hunting or protecting, or if someone seriously irritates them. Irritating them is rare, but not unheard off. 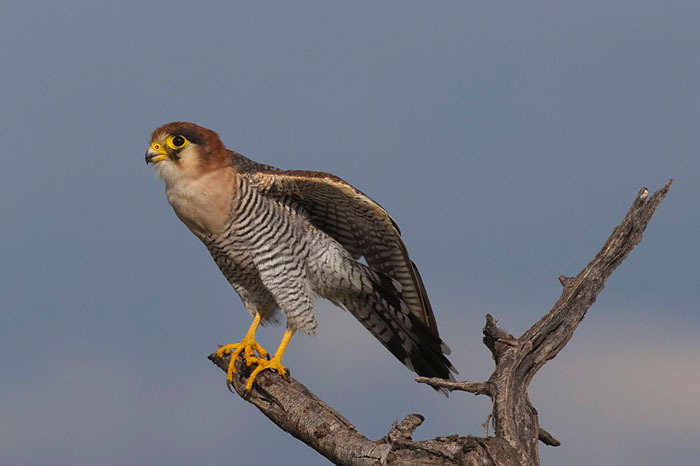 This post is about a very interesting encounter I had with an adult red-necked falcon in Etosha National Park in northern Namibia. Every evening, I would go out of the research camp to check our camera traps. Since it was all about serious work, I rarely carried my camera gear with me. And as I’ve always believed, you see some of the most amazing things when you don’t have a camera with you. That day was no different. 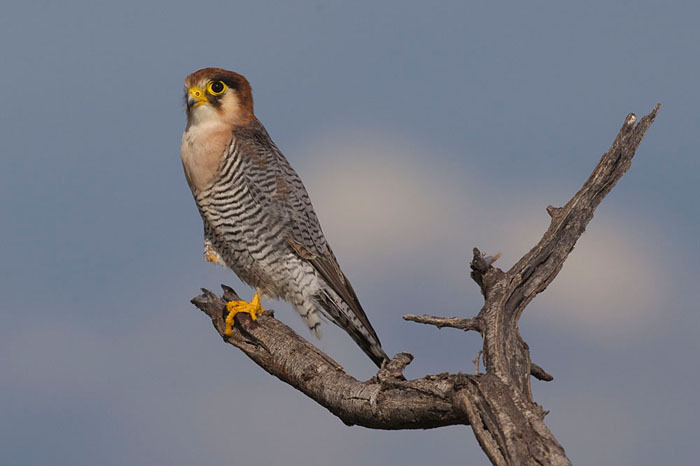 Half a kilometer from the camp I see this beautiful falcon sitting on an open perch (a dead tree). I actually drove past it, but turned around and came back to look at it. The tree was probably 20-30 feet away from the road at most. The road sees heavy traffic of lion-seeking tourists who will not stop for a bird; unless the bird’s a vulture waiting for the lions to leave a carcass! Yep, no camera means great sighting. Belief strengthened. 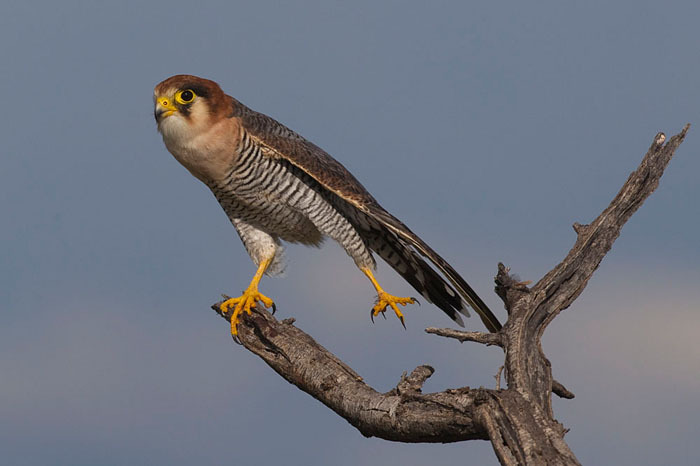 I had only ever seen red-necked falcons twice in my life before and both of them were very fleeting glimpses. 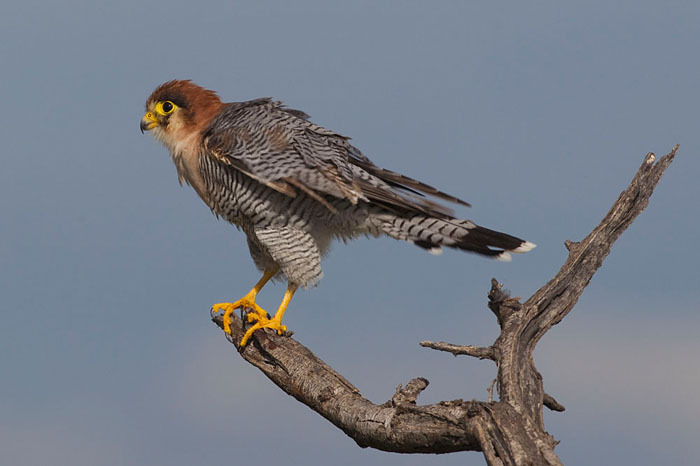 My first sighting was in Bandipur when a red-necked falcon was hunting a buttonquail right next to the road, but flew away as soon as we stopped and the second sighting was a near-silhouette, also in Bandipur. That was a good seven years ago which meant the Etosha sighting was very special for me. 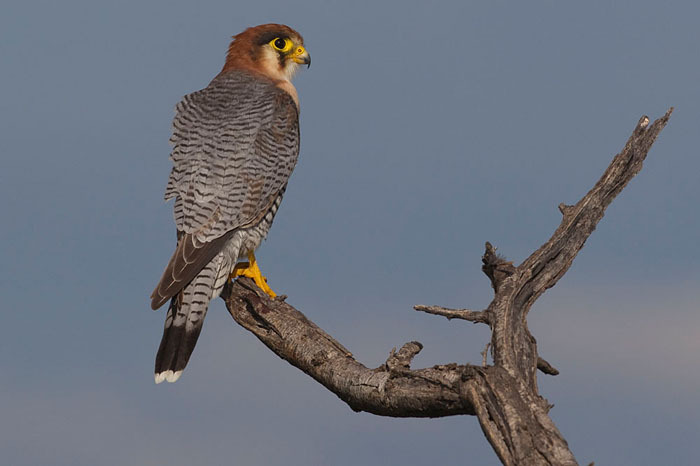 I always have binoculars on me when in the field and I got some fascinating views of the falcon. Satisfied with what I had seen, I went about my daily task. I drove 10 kilometers, changed batteries on a camera trap, and drove 10 kilometers back. 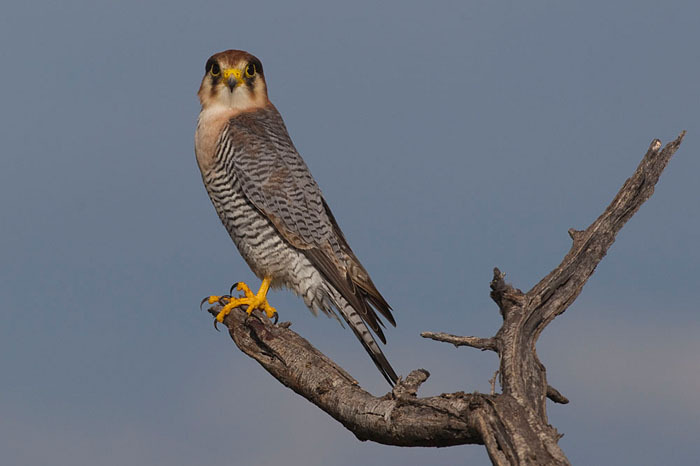 I had probably taken about 30-40 minutes on the trip and when I got back, the falcon was still on the same perch! It wanted its picture taken, I suppose? I didn’t stop to look at the bird this time because all I wanted was to go to my tent and get my camera gear and see if the bird was still interested in doing a photo session with me. I was pessimistic about my chances and the park gates would close in half an hour. Slim chances, but worth a shot. 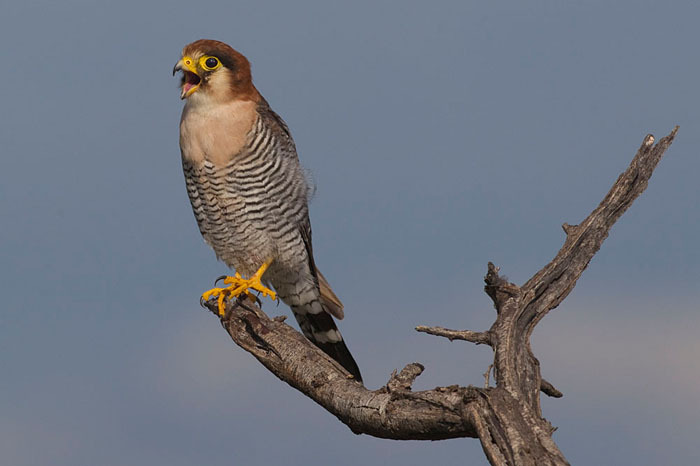 I was back at the tree ten minutes later and the falcon was still there! A quick shot later I was happy that I had recorded my sighting. Now, I parked my truck on the side of the road, shut off the engine and aimed at the bird again. Ten more shots later, the bird hadn’t moved. I wondered if something was wrong with it as it wasn’t bothered by my presence. It didn’t even look at me. Countless cars rushed by hoping to beat the park gate closing time, kicking up dust and pebbles; and still the falcon just stood there without a worry. I did a quick time check and found that I still had at least 20 minutes, and I was probably 2 minutes away from the gate so I didn’t have to rush, so I continued taking photographs. 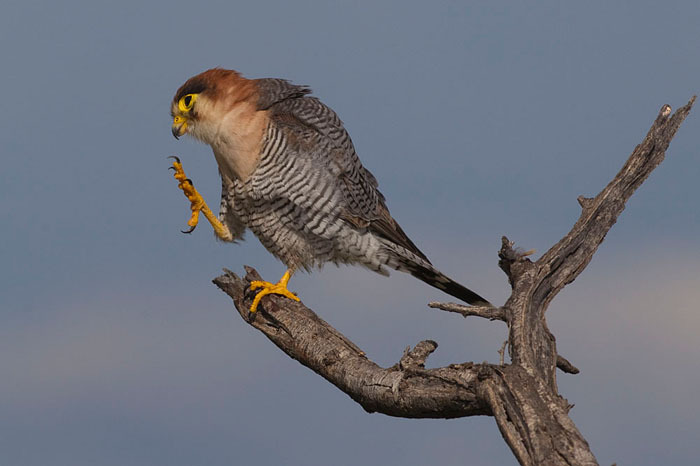 First a wing-check, then a stretch, then a scratch, then a yawn, then a flutter of its feathers, then a 180 degree turn followed by another 180 degree turn. It then looked straight into my lens — the only time it ever looked at me. Now, I love taking pictures of animals looking at me and I was thrilled to get that photograph. That meant I would do the silly thing of taking my eyes off the bird to look at the display screen of my camera — like anyone with a DSLR would do. Mistake. Happy with my latest photograph, I looked at the perch again. And all I saw was an empty perch!